Who’s been to Prescott, Arizona? C’mon, raise your hands. If not, it’s something you should really consider. 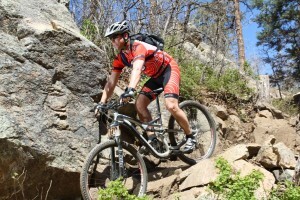 Even more so if you register for the Whiskey Off Road mountain bike race put on by Epic Rides. And make sure you pronounce Prescott correctly. It rhymes with “biscuit”. This year, Michelle Faucher and I took part, she in the “50 Proof” (50 mile course) and me in the “25 Proof” (which was actually 30 miles). Luckily, I have very good friends who live in Prescott Valley so lodging for the two of us was the easy, and cheap part. Many thanks to Christina Carmody and Chris Hummel for a great week of hosting us. We arrived, via Phoenix, on Wednesday afternoon. I planned this to make sure, 1) I could get some good rest pre-race especially with the time difference, and 2) to acclimatize to the elevation, at least a bit, before race day. Prescott sits at 5200 ft and the race would take us up in the mountains outside the city to a max of 7000. Not terrible, but enough to make a difference to us sea level dwellers. Thursday was a prep and tourist day. I’d shipped my bike via FedEx. That was, to say the least, COSTLY, at $225. I have a somewhat unwieldy but sturdy bike box (which, by-the-way, I’m willing to lend out should any of you ever be in need) and it would have cost me almost the same and been a real pain to travel with. Michelle brought her bike with her on Southwest Airlines for a very reasonable $75, each way of course. Anyway, Michelle and I re-assembled our trusty steeds Thursday morning and then did some afternoon hiking around The Granite Dells of Prescott. In the evening we all ventured up and over Mingus Mountain to the historic mining and now charming, artsy, tourist village of Jerome for a great Mexican meal at Quince.15. After check-in we headed to a couple of local breweries/eateries (The Raven, and Granite Mountain Brewery) to imbibe some and await the late afternoon Pro Crits which would determine the Pro starting positions for their races on Sunday. That was interesting and entertaining and afterwards, a great Italian dinner at Papa’s Uptown before heading back home to finalize prep and an early bed. RACE DAY…….. WOOHOOO!!!! Michelle and Chris were up and off early, as their start for the 50 Proof was 0730. I slept in a bit and Christina and I got downtown about 0900 for my 0930 start on the 25 Proof on a PERFECT Arizona day; brilliantly sunny, a slight breath of a breeze here and there and about 65 degrees. Temps would rise a good bit throughout the day, even at elevation, and “PERFECT” may have been a little cooler, but all-in-all a great riding day. I was rested, I’d eaten (yogurt and granola breakfast, pre-emptive Ibuprofen and 4 pre-race Sport Legs capsules), all stretched out and ready to go when the gun went off. With absolutely no knowledge or experience on this course, and having no illusions of being “competitive” in this “race”, I started off well near the rear of the 796 racer field. (There were 618 racers in Michelle’s 50 Proof). If you’d like to see the course you can check out my Garmin download, but essentially it’s an 11 mile climb (the first 4.2 on city streets, then various fire roads, jeep tracks and single track) a 5 mile descent a 5 mile climb and a 10 mile descent. Ok, ok, there may have been 500 or 600 yards of flat somewhere along the way. Like with any race, it was hard not to get caught up in the adrenaline and excitement at the start, but I worked hard on not busting it out of the gate. I need a notoriously long time to warm up and I’m not a particularly strong climber to begin with so I was really concentrating on keeping a reasonable, steady pace so I’d have enough to perform decently on the second long climb I knew was ahead. Plus, we did get foreknowledge that the start into the single track always bottlenecks and there was no way I was beating the crowd up, so easing in to it was a good plan anyway. Up and up and up we went. It took me about 45 minutes to get the 6-ish miles to the single track and shortly in to that, the infamous bottle necking started. For the next mile or so we would ride 50 yds, then have to stop and stand around for 4-6 minutes, then ride then stop. It’s unfortunate because this part was through beautiful, smooth, gently up-and-down pine forest and it was frustrating not to be able to ride it out. Eventually we got to the few small “technical” sections that were the cause of the bottlenecking. I have two complaints about this race and this was #1. Because this was a known problem, the race was lengthened a bit this year and this section was added to help avoid the fire road to single track transition bottleneck. Unfortunately it probably made it worse. They do need to devise some sort of staged start to avoid this problem as all told, we probably lost 25-30 minutes of time standing around. Eventually the riding opened up and there was not any more problems with stops the rest of the race. BUT (and you knew there was a “but” coming) this is where things got pretty damn tough. It’s Arizona, you know, the “dry” heat. Well, heat wasn’t a problem yet, but the “dry,” which meant dusty, loose gravelly, sandy trail, along with the “steep” (and yes, still going UP) kinda was. Throw in completely exposed telephone poles used as trail water breaks and you can already guess, I joined the crowd in doing a fair amount of walking in this section. Near the top, I took my first little break, stopping to get my heart rate down below 185 and eat a little food. I had a Honey Stinger Waffle, some Hammer Gel and 4 Sport Leg capsules. By this time, near the top of the first climb, about 2 hours in, exposed to the sun and still not really any wind to speak of, it was really getting hot. I suppose I should mention, for this ride I was wearing my 70 oz. camelback and drinking generously. I only stopped for 3-5 minutes and then headed out………up some more. Not too much more though and then it was time for some SERIOUS down. 1300 ft in 4 miles. Yep, there was some white knucklin’ goin’ on there. Big rocks, drop-offs, sand pits……….. At one particularly nasty rock drop I got caught up and took my first spill (yes, there would be more). I’m not sure if I was lucky or unlucky that I was going slow at that point. I didn’t tumble off the mountain and die, or at least I don’t think, but it did bring me down on the rock pile, tearing up my left “hip” which is more to say………buttock, and ruining my beloved THWT bibs. DRAT!!!! Actually, “OW….DRAT (except with a “F—!!!“)”. Generally when this happens, assuming I’m not really hurt, I rub some dirt on it and move on. This time, with the aforementioned sandy, dusty trail, this step was already taken care of, so on I went. At the bottom we came back to fire road for big climb number two. Not technical and in pretty good condition, it was a 2 mile uphill slog to Aid Station #1. This is the point where those on the 50 Proof would head west on fire road for 10 miles downhill to Skull Valley, then turn around and return making it Aid Stations 1 and 3 for them. This is the only difference in the 50 and 25 Proof courses. I stopped for a good 20 minutes this time. My Garmin was reading close to 90 degrees, though I’m not sure it was really that warm. I found some shade and ate again. A couple of orange slices from the Aid tent, a Tropical Hammer Gel, an entire Pocket Fuel packet and finished off the last of my camelback. I also took 4 more Sport Legs capsules and more Aleve. As I went to re-fill my camelback I ran in to complaint #2. The Aid Station was concerned about running out of water and ask us not to completely fill our bladders. REALLY??? Of all the race logistics to be sure is properly stocked, that should be #1. I filled up ¾ and started climbing again. From here the road, although not paved, is a county road, so nicely graded and maintained. That’s not to say it isn’t steep, just very ridable. Again I set myself in to a nice, steady pedaling pace, not so much concerned with speed as with being able to ride the entire way to the top without bonking, cramping, or…….at this point……..puking. I saw or heard some of each along the way. Not far from the top was, as promised, a dude offering up whiskey shots. It is the WHISKEY Off Road, after all. I swore, before the race, I would stop partake, but shortly before getting there my stomach began to bother me a bit. I probably over ate at the Aid Station, but no matter the reason I wasn’t about to jeopardize all my efforts so far with getting really sick, so I passed it up. After 3 miles from Aid Station #1, you hit single track again, and the top, just under 7000 feet. I gotta tell you, at this point, I was VERY glad to see down, and exhausted mentally and physically, which probably led, not too far in to this once again technical downhill, to spill #2. I kind of registered the thicker sandy portion in front of me but not soon enough react properly and the next thing I knew I was slamming in to the trail at a brisk 16 mph or so, this time on my right side. DRAT!!!! Actually, “OW….DRAT (except with a “F—!!!“)”. I’m sure the guy behind me had a pretty good show. There was a wide area here and I was able to drag myself off the trail and recover for a minute or two. A little bit shaken and feeling some trepidation about several more miles of hard downhill, I proceeded, but markedly slower and more careful. More quickly than expected I regained some of my confidence and let my speed creep up the further I went, although I’m not sure I ever completely let off the brakes for a good few miles. Somewhere in here, just out of fatigue, and stupidity, I fell over again, which is not remarkable other than managing to put my hand right in to a cactus-like stickery sort of shrubbery. Another minute or two getting over being angry about it (we’ve all been in that mental state, I think) whilst pulling thorns from my hand. Cramp Hill (yes, that’s really its name). You know it’s there, if you look at the course ahead of time, but somehow you forget. Just when you’ve adjusted to no more climbing…..there it is. It’s not big, it’s not overly steep, and it’s only about a mile long, if that……..but it’s a mental crusher. Ughhhhh, I don’t WANT to go uphill!!!! (in as whiny a voice as you can muster) I walked a little bit of the steepest part of this, but…….no cramp. I’m told many people did. From the top of Cramp Hill it’s winding, flowing trail, sometimes rocky, down to and then along a creek and then finally, back on to paved road for the last 4 miles downhill. I was rather surprised at what I had left to get me down this and I knew my mental state would soar once I hit pavement, which it did. What a great way to end this race, screaming downhill in to town, topping out at 31.2 mph. And finally, cheering, waving crowds at the finish. A grateful and appreciative shout-out here to some of my gear and supplies. First and foremost, I LOVE, LOVE, LOVE my Stans No Tubes CREST wheels. They handled all of the various terrain of this course phenomenally and gave me great confidence to ride, clearly, at the edge of my technical limits. Since I’d forgotten to bring my usual electrolyte supplements, Sport Legs were recommended to me by a local bike shop and they were AWESOME. I felt far better on my climbs than I expected, lasted longer and can truthfully say, although fatigued the next day, my legs were not the slightest bit sore. Amazing!!! I’m a convert. And finally, great Congrats to Michelle. Although I’m sure she has her own story to tell, she ROCKED this race. Unfortunately, she appears nowhere in the official results for this race so, of course, that means I WIN!!!!!!!! But that’s a technical glitch I’m sure she’ll get worked out. Seriously, she was awesome! Despite a few hiccups, this was a great race and I’d HIGHLY recommend it be on anyone’s list of races to do. It was a hard challenge and a lot of fun and the town of Prescott is a great place to visit. Even if you’re not into the competitive frame of mind, the weather in this part of AZ makes it ideal for riding nearly year round and there are literally hundreds of miles of trails around the city, from flat paved bike trails to mountainous and technical single track. Go West…..and Ride! Are you sick of flats? Always wanted to go tubeless but didn’t know how? You are invited to join us next Tuesday evening, July 24th @ 7pm at Spokes, Etc. 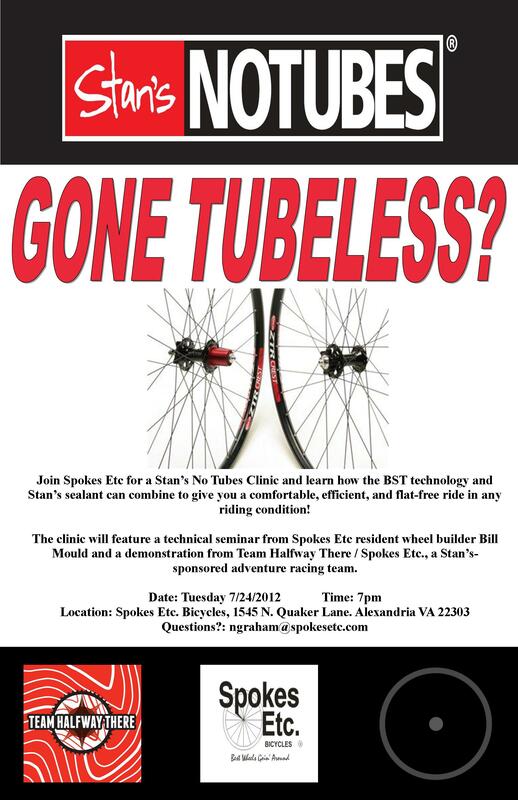 located at 1545 N. Quaker Lane in Alexandria, VA for a Stan’s NoTubes Clinic. If you’ve ever wanted to go tubeless but felt the process is too difficult, here’s your chance to learn how easy it can be from master wheel builder Bill Mould. After which, we’ll have a live demo and then you’ll have the chance to try it yourself, so bring your wheels and leave your tubes. Spokes, Etc. 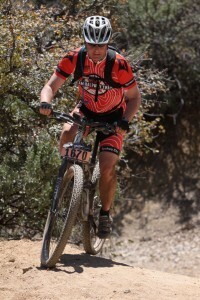 will have Stan’s product available for purchase and then members of TeamHalfwayThere.com and Odyssey Adventure Racing-ImONPoint.org will help get you into a tubeless setup. Soon you’ll be enjoying the plush ride of NoTubes and more importantly, no flats. Contributed by Candy Hagerman | Race Date: March 17, 2012 | http://bit.ly/GBQJCF Why did I sign up for this race? 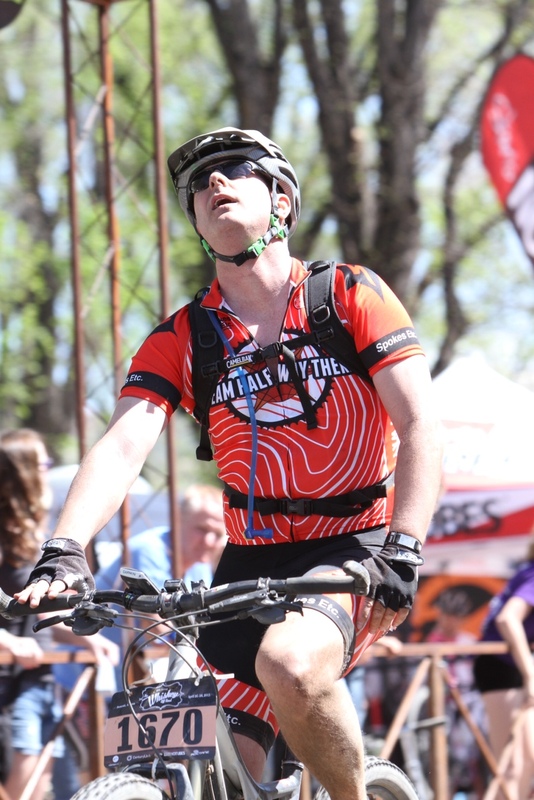 I signed up for this race because our good friends, Andy and Michelle started an adventure racing company, Adventure Addicts Racing, and this was going to be their inaugural race. 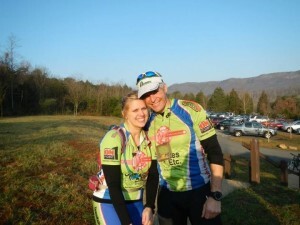 It was an opportunity to support them and to race with my favorite person, my husband Shane! Shane and I were both so excited to race together in the 6 hour race. We have raced together in the past and loved it. Many people say, “How can you race with your husband?” My response is “I love to race with him!” He is so strong and incredibly helpful and encouraging. Before I ever raced with him, I knew what I was getting in to. He is very competitive and focused. I made it very clear to him years ago that I wanted to race to have FUN! And secretly, I am competitive too. Fjallraven Kanken No.2 I knew whenever I raced with him, we would have fun and if I wanted to push myself, he would happily support that! This brings us to getting ready for the race. Yes, we even had a lot of fun getting ready for the race. The majority of our friends to include Shane are very experienced racers, so “getting ready” for a 6 hour race is probably very different for them as it is for me. Shane has spoiled me with every piece of gear imaginable, so it is hard to come up with something that I need to buy for racing. But, that wasn’t going to stand in my way of shopping for fun gear. I love to shop and knew that more cool gear would add to the excitement. The race was on St. Patty’s Day, so of course I bought some green shirts at REI to wear post race. Two of my favorite purchases were a new pink smaller Gregory pack and new trail running shoes, the Cascadia 7’s. Shane insisted that the new shoes would help me run faster through the woods and have better grip. While trying them on at REI, a girl said she had a pair and loved them. That sealed the deal and off I went with new (cute blue) trail shoes and they proved to be the most comfortable trail shoes ever with great stability and grip. And of course, I wanted a lighter weight pack so it didn’t weigh me down and if I needed to give it to Shane it would fit in his pack. 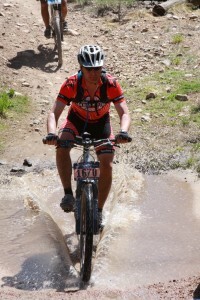 The pack was so comfortable and light weight that I didn’t need to take it off and always had my water ready to drink. Definitely a good purchase! As you can tell, we both are really excited for this race. We spend the night before packing and talking about how great it is going to be to race and see all of our friends. I’m hoping we can get to bed early so that we have a good night’s sleep before waking up at 4am to drive to Front Royal. Life doesn’t always go as planned. We stayed up too late and I got about 3 hours of sleep and Shane 2. Early morning was here before we knew it and off we went to Front Royal. When we arrived, we were greeted by the friendliest volunteers and the vibe of the event was amazing. Everyone was in good spirits and the weather was going to be at perfect temperatures. This was going to be a great day! Shane and I had the biggest smiles on our faces as the race started. I was focused on having fun and not putting any pressure on what place we finished. There were so many teams with countless years of experience. I wasn’t worried about how we were going to finish…until we saw three Marines with green t-shirts and Joey and Shannon Baird. These two teams soon became the reason why I went from wanting to have fun to wanting to compete. Of course Shane loves when this happens and he definitely likes to see what buttons will make me go even faster. I’m in the Navy Reserves so naturally, he had some jokes about what the Marines are probably saying about the Navy. This didn’t motivate me as much as wanting to stay in front of Joey and his wife. Wherever I looked, they seemed to be there; slightly in front of us and smiling and joking with a great attitude. Running Asics Sneakers I thought, well, we can stay with them and hopefully get in front of them. We had to climb a lot of hills and to me they felt like mountains! One specifically on the second trek section we climbed happened to have some sort of animal trail, so we climbed right up it. I was so happy when I got to the top. It didn’t matter that I was huffing and puffing, I had made it up that hill! We start running and I asked Shane where the passport was. asics femme pas cher He is very specific about putting it in a pouch right away to avoid losing it. He grabbed the pouch and said, “I don’t have it!” I wanted to cry as soon as I heard these words and looked down the hill “mountain” we had just climbed. He said, “We have to back track and trace all of our steps so we can find it.” I was thinking, “Yah right, we will never find it, I was looking at piles of leaves and literally wanted to sit down and start crying. I knew he was more mad at himself than I could ever be, so I kept quiet and started backtracking with him. And, just as we climbed what appeared to be a deer trail, he was running just like a deer. I figured, “Oh well, we worked really hard and it is ok if we don’t have an official finish.” As soon as I thought this, I hear him say, “I found it!” I snapped my head back and looked up at the sky as the sun was shining in my face and I threw my hands up saying, “Thank God!” The only bad part was Joey and his wife were long gone and so were the Marines. I didn’t think we would ever catch up to them after this. The next part of the event was going to be the paddle section. Nike Sko Norge Nettbutikk I knew we would do well on the water. One of our favorite things to do together is go paddling. We got to the boats and saw a bunch of teams in front of us. We quickly got in the water and were off. Paddling with Shane is like having a motor in the boat. He is the strongest paddler I have ever met. We paddled hard and ended up passing at least 7 teams. There is something so motivating about passing a team. It is almost like it gives you twice the energy than you had before, no matter how tired you are. The good news was, we were able to get in front of Joey and the three Marines. I know, this seemed to be the only thing I was worried about. After the paddle, we had a long trek section. It seemed to go on forever!!! As we were running, I would look back hoping I did not see their shirts. I was running, trekking and bushwhacking faster at this point than I was at the beginning of the race. Kånken Laptop 13 One of my favorite points on this trek section was a point on the mountain with a breathtaking view. nike tn femme Shane had pointed it out during the paddle and it was great to finally arrive there. Yes, I did stop to drink it in. It gave me chills and made me feel so alive! I knew immediately that Michelle and Andy put a lot of thought into the placement of this checkpoint. Wow, I so appreciated it and needed it! We were running long and hard during the trek and finally reached our bikes with no sign of our made up nemesis’s. I was happy we were doing so well. Air Jordan 10 Uomo We were right where we wanted to be and were on our way to the finish. As we were leaving on our bikes, we saw Joey and Shannon. I thought, “NO!! !” So, we knew we had to bike extra hard so they didn’t catch us. Shane kept telling me what strong bikers they were and how important it was for us to push hard to the finish. I was peddling my little heart out and didn’t care how much it hurt because I knew we were almost finished and we could beat them if we went fast and hard. So, we come riding in as fast as we could into the race finish. Kelly says, wow, you guys are doing good. We are like, “Yah, we are done, this is the finish!” She tells us, “No, this is not the finish, there is one more checkpoint #19.” I couldn’t believe my ears. I just gave everything I had and we still had to go find another checkpoint? I couldn’t believe it. I wanted to cry and stop but knew if we could just hurry up and find the checkpoint maybe we could finish before Joey and Shannon. Sorry to use your name so much Joey, I told you when we finished that I never need to hear your name again – now you know why! This begins my lowest and highest point of the race. Giving up wasn’t an option, so we went right back out to find checkpoint 19. Goedkoop Nike Air Max The pressure was really on Shane to make sure he knew exactly where it was. He knew I was empty and was trying my very best. We ended up getting slightly turned around in the woods and finally figured out exactly where we needed to go. And, unfortunately, as we were out there, who do we see? The Bairds – looking strong as they rode up to us, along with us and then slowly pulled away on a big climb. When I saw them my heart sank. I thought, oh no, after all this hard work they caught back up to us. Then I thought, well they are really good and at this point what can we do? So, Shane started towing me on bike up the hills. I was so frustrated and as they pulled away I thought, wow, we are going to come in after them even though we tried so hard. I was feeling sorry for myself and the hills seemed like mountains once again. We were going up a very steep section, Joey and Shannon were nearly out of sight, the tow system broke and I wiped out. I was hurting and for a second thought, I can just throw my bike off the mountain and give up. Then, I thought, no, now is the time to dig deep. I will give everything until I see the finish. I got back on the bike we climbed a bit more and the trail leveled out. Then Shane tells me to get off my bike and follow him through the woods. I was like, come on, are you crazy! Let’s just try to keep up with them. So, he said “trust me.” Of course I trust him so without hesitation we cut through the woods and end up coming out on the trail. In a few seconds we see Joey and his wife behind us. I thought, yes! Maybe we can keep up. Well, they kept going and I thought, oh no my legs can’t go as fast as theirs. I kept riding and we finally could see checkpoint 19. Joey got there a few seconds before Shane and Shannon and I turned around to start pedaling. We both were so tired. I started pedaling and knew this time for sure we were biking to the finish. Something inside me thought, come on Candy don’t give up, you worked so hard, finish strong! So, I pedaled harder and harder and went faster and faster. It felt so good to be going fast and not struggling up the same hills. I didn’t care about whether or not I would wipe out. 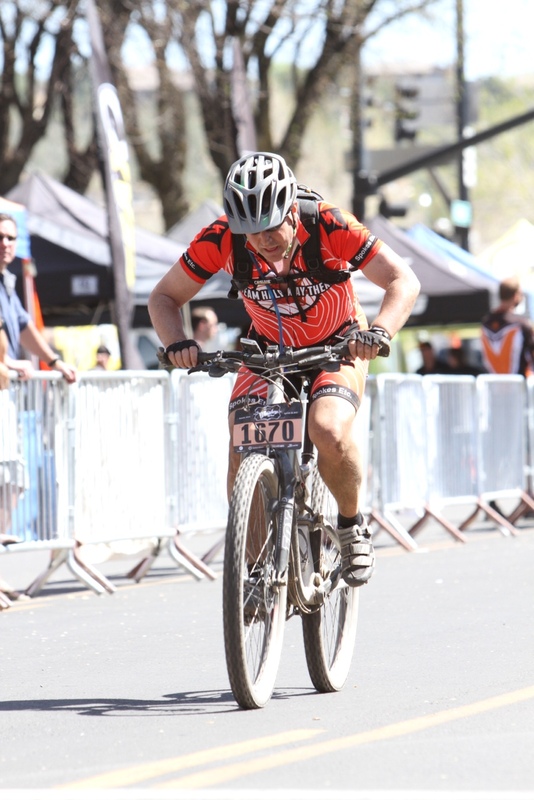 I wanted to ride as fast and as hard as I could so that when I finished, I knew I did not give up. I didn’t know how close people were behind me, but I knew I was riding as fast and as hard as I have ever ridden a mountain bike. And I learned that the faster you go, the easier it is! We came out of the woods and up to the finish line and yes, I still looked to see if Joey and Shannon had beaten us to the finish line and thankfully they hadn’t! This race wasn’t really about finishing before Joey and Shannon. It was about reminding myself of the things I already know and that is to never give up no matter how difficult something is. Adidas Yeezy Boost 350 The Bairds happened to be something I could focus on and use to channel my determination. It has been only a few years since I had battled cancer and I knew how important it was to not only be physically strong, but to be mentally strong too. After all, life is about putting one foot in front of the other and not giving up. Thank you Adventure Addicts Racing for putting on a great race. I felt the adrenaline, enjoyed the people and scenery and most importantly, pushed myself beyond what I thought I was capable of. I will use this experience as a positive touch stone throughout life and remind myself that giving up is not an option. And a special thank you to Joey and Shannon, you guys are absolutely amazing. Shane, I love you and I love having you as my partner in life. Your strength, love and encouragement inspire me daily.